It will be another weekend of great Mossy sailing on the water and socialising of it . Don't worry if you haven't got a spinnaker you are still welcome, to join in with the local non spinnaker fleet on Saturday, or just sail with the spinnaker Mossys all weekend, lots of races lots of starting practice etc . Everyone welcome, good spectator viewing from the club, it's going to be a great weekend and a good chance to tune up for the Nats. Will be a great regatta - I am looking for a spinnaker boat for a very experienced sailor who is looking to join the fleet for the weekend (Robbie Lovig). If you know of any boats available, please contact me. Has Robbie had a go on a Mossie with spinnaker? What did he think? I know he liked the Mossie without spinnaker when it was windy. He was pretty quick when there was some wind at the Non Spin States at Somers. Hope we can find him a Mossy with Spin. I have a spare Spin if that is any help, will keep ears open for any potential boats. Last edited by stillbitten; 11/10/15 08:18 PM. i think hes had a go at mine causal sailing not racing tho. Looks like I am shaky now for states, went sailboarding late yesterday arvo and got thrown off the board at high speed and hit the water backwards and hyper extended my back, struggled to get back to shore. Now moving hurts, only thing I can do comfortably is sit in a seat, Physio's advice is rest and recuperate. Matt you found a boat for Robbie yet? Don't know if I will make it, Physio today said less than 50% chance, I have had some Xrays today no obvious fractures so thats good , won't get final word till Friday 1pm. Driving is still a big problem, never mind sailing . But I live in hope. Anyone thinking of coming along to the Spin States this weekend, please fill out the Entry Form before Saturday. It's much easier and quicker to do it now than wait until the day. Hope the sailing goes well, should be able to see results on Sailres. Vic Spinnaker States, only 5 brave Mossies on the beach, winds gusting 20 knots, should make for some awesome spinnaker sailing, Peter N, Neil, Daniel, Matt and Robbie L are racing now. Where are the rest of you? First 2 races completed, Daniel leads from Robbie. Pete and Matt have a DNF? Results are up on Sailres, just search Mosquito and look for 10th Victorian Spinnaker Titles. Only boats that didn't have a swim where Daniel & Robbie, well done. Pete got 3rd in the last race with out using the kite, thanks to a swim by Neil and Matt Sabotaging Robbie. Sounds like a big night tonight at the club, with more Mossie sailors arriving and in the morning, forecast is for lighter winds and I think apart from Daniel they are all looking forward to an easier day tomorrow. Waves where not big today, but seastate was described as a washing machine, very confused. Club race fleet was small today so I guess, if the locals aren't keen to go out, it was tough conditions for the Mossies. Well done to them all . Last edited by stillbitten; 11/21/15 01:15 AM. Day 2 finished, Mossies are back on the beach, wind has varied from light 5-8 knots, to fresh gusting to 17 knots. Ended up with 8 Mossies as Phillip WS, Trevor & Eliza and Mitch Meade (on boat borrowed from local, Jeremy) joined in today. Last edited by stillbitten; 11/21/15 10:21 PM. Thanks for the summary of results. Any photos of the sailing? I was watching from Paynesville on 1 minute still shot beach cam and wind strength on Willy Weather, so beach cam shot is the best I could do. With the weather being nasty yesterday for normal club race and the few club members on deck today being busy running the races I wouldn't hold my breath for on water shots. But Matt has put this on the Mossie Facebook site. "Matt Stone Today was lighter. Started off in 3 to 5 knots, pin end biased startline with the tide running out making it hard as it was pushing us over the line, i won the first race of the day with dolphins swimming anf jumping out just in front of the bows and under boat, great site to see. 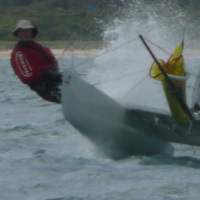 Wind was about 10 knots i the next 2 races, robbie found the fine line of the very complicated maskeil boat. Came down to the last mark on the downwind port stb rule ( call stb on me so i jybed and they jybe, grr made me angry) well done Robbie Lovig, i will get u next time. Wind picked up to about 13 knots, and most boats have been over laying the mark as the forgot the tide home knowlage and sailing angles came to an advantage, but robbie daniel and i at gate with pressure on daniel getting down kite with tangles in ropes caused a swim made him slip back a few places. One race people forgot how to count laps as i finished race in 1st and people were doing another lap and question myself , but nope i was right. Really good racing and thanks for somers yc pit on the regatta for us. We did have 10 races planned but tume ran out and 8 races were run. Thanks to all the resuce crew and race officer and the club providing the dinner, was a successful weekend"